The release of components from dental materials may cause oxidative stress which is crucial factor for tissue damage and cell apoptosis or death. The aim of this study was to evaluate the cytotoxicity of different flowable composites and this materials effect on total antioxidant capacity (TAC) and total oxidant status (TOS) level in human gingival fibroblast cell culture. Gingival fibroblast cells obtained from healthy persons were used for evaluation the cytotoxicity and oxidant status. Six flowable composites used were: two bulk-fill flowable composites (SureFil SDR, X-tra base), a self-adhering flowable composite (Vertise Flow), a highly filled flowable composite (GrandioSO Flow), two conventional flowable composites (Filtek Ultimate, Clearfil Majesty). Specimens in 3 mm diameter, 2 mm height were prepared from each composite (n=6) and were transferred to 24 well plates. Wells without composite material were used as the control group. After 24 h incubation period, cytotoxicity was determined by using the 3-(4,5 dimetylthiazol-2-yl)-2,5 diphenlytetrazolium bromide (MTT) assay. Oxidative alterations were assessed using TAC and TOS assay kits. Data were analyzed using the ANOVA and least significant differences posthoc test. Cytotoxicity of six materials was significantly different from the control group (p<0.05). Vertise flow was the most cytotoxic material. TAC levels of Vertise flow were significantly different from X-tra base and GrandioSO. TOS levels increased in SureFil SDR and Vertise flow groups but it was not statistically significant difference. All of the materials used in this study showed cytotoxic effect in human gingival fibroblast cell culture. These materials did not have a significant effect on TOS level. However, TAC level could not prevent the rise of TOS level in Vertise and sureFil SDR. Flowable composites were introduced in 1990s and they have been designed to provide improved adaptation and polymerization stress relief. The low viscosity of these materials allows them to shape itself to fit in the difficult access cavity areas (1,2). Flowable composites are suitable for small class III or class V restorations, enamel defects, margin repairs or as cavity liners (3,4). However, there are some problems associated with their poor mechanical properties, lower filler content, polymerization shrinkage and weak adhesion (1,3). Manufacturers have recently introduced new generation flowable composites, so called higher filler loading flowable resin composites, bulk-fill flowable composites and self-adhering flowable composites for elimination of negative effects and improving clinical requirements (3,5). Higher filler loading flowable resin composites for posterior restorations have better wear resistance compared with some resin composites (6). Bulk-fill composite resins specifically designed for placement in single layers of 4 to 5 mm and have lower polymerization shrinkage and stress values when compared with conventional flowable composite resins (7,8). 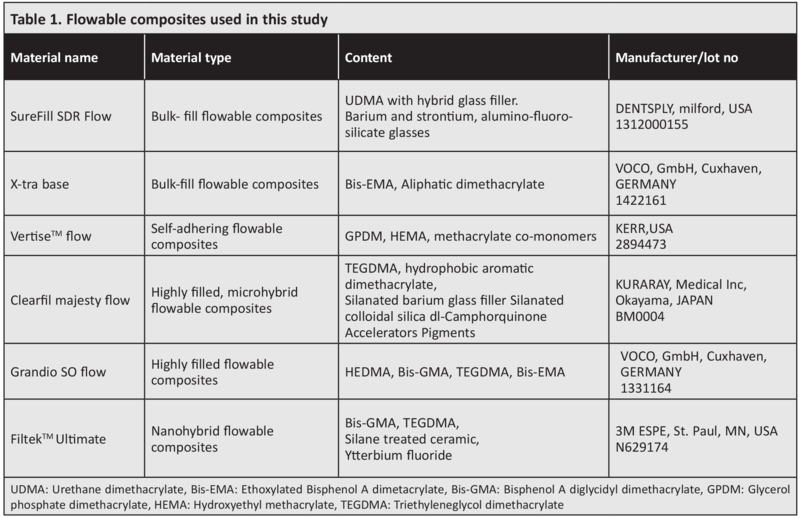 Self-adhesive flowable composites includes acidic monomer like glycerol phosphate dimethacrylate (GPDM) and can be bonded to tooth structures without using adhesive systems (9). The biocompatibility has gained considerable interest during recent decades and is the important factor for evaluation of materials clinical success, as well as the physical properties (10). Chemical composition of composite material, degradation of material, degree of monomer conversion, surface treatment and conditions within the oral cavity may cause to release substances into the oral environment (11,12). Inadequate polymerization can cause to release methyl methacrylate (MMA), hydroxyethyl methacrylate (HEMA), bisphenol A diglycidyl dimethacrylate (Bis-GMA), triethyleneglycol dimethacrylate (TEGDMA), and urethane dimethacrylate (UDMA) from the resin matrix (13,14). These monomers are associated with cytotoxicity and oxidative stress in tissue or cell and influence the signal transduction pathways and complex regulatory cellular networks. Moreover, this monomer deplete the amount of glutathione and cause to increase the formation of reactive oxygen species (ROS) (14,15). As a result of aerobic metabolism, ROS are occurred in cells. Low concentrations of ROS are compatible with normal physiological functions, whereas high concentrations of ROS are considered to be harmful to cells, leading to oxidative stress (16). Antioxidant systems neutralize these reactive molecules and protect cells from potential cytotoxic effects. But when the balance between oxidants and antioxidants is disrupted, oxidative stress occurs (15,17). The objective of this study was to evaluate in vitro cytotoxicity of different flowable composites materials and their effects on total antioxidant capacity (TAC) and total oxidant status (TOS) levels in human gingival fibroblast (HGF) cell culture. This study was granted ethical approval by the Ethical Committee of the Atatürk University Faculty of Dentistry (22.04.2016/23) and conducted in accordance with the Declaration of Helsinki. Informed consent was obtained from all patients. The cytotoxic effects of flowable composites on HGF cell culture, were evaluated using the direct contact test method and 3-(4,5-dimethylthiazol-2-yl)-2,5-diphenyltetrazolium bromide (MTT) assay. Oxidative alterations were determined by measuring of TAC and TOS level. Six different flowable composite materials were used in the study. The materials used and their contents are demonstrated in Table 1. Samples in a disc shape, 3 mm diameter and 2 mm height, were prepared from each restorative material. Six samples in disc shape using a teflon mold were prepared from each restorative material. The materials placed in the mold were covered with transparent tape (mylar strip) and left to harden between two glasses. Resin containing materials was polymerized using a visible blue LED light device (Elipar Freelight II, 3M-ESPE, St. Paul, MN, USA) at a wavelength of 450 nm according to manufacturer instructions. The edges and surfaces of samples were straightened using polishing discs (Sof-Lex; 3M ESPE, St. Paul, MN, USA). Samples were transferred to well plates, Wells without flowable composite material were determined as the control group. 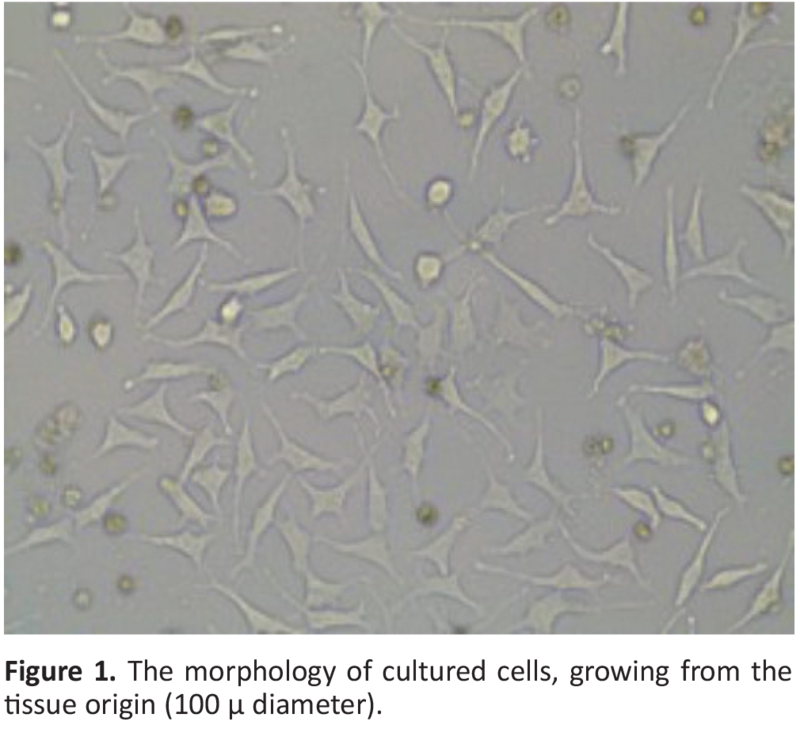 Cultured HGF cells were used in this study. Gingival tissue samples were obtained from young healthy donors tissue overlying impacted third molars by the informed written consent of the patients (aged 18-25). The gingival tissue pieces immediately were placed in 2 cc Dulbeccos Modified Eagles Medium/F12 (DMEM: Gibco BRL, New York, USA). The samples were washed by normal saline and then by DMEM medium for 2-3 min. Gingival tissue was cut into approximately 1x1 mm pieces in size and placed in 50 cc falkon for washing small parts and blood cells residues. The samples were seeded in the well plate (Corning, New York, USA) then 2 cc DMEM/F12 medium with 10% heat-inactivated fetal calf serum (FCS), 100 U/mL penicillin, 100 µg/mL streptomycin and 1% amphotericin B (Gibco BRL, New York, USA) added and incubated at 37 °C in a humidified atmosphere of 95% air and 5% CO2 (Incubator ESCO, SINGAPORE) and the old medium was replaced with fresh medium twice a week. The morphology of primary HGF resulted in spindle shaped cells (Figure 1). When the plate obtain 70-80% confluency (the cell number was 1x106 cells/mL), the primary HGFs were trypsinate. HGFs were used in the third passages. After 24 h material-cells interaction periods, MTT assay was carried out with a commercially available kit (Sigma, USA). MTT reagent (10 μL) was added into the cell culture. The plate was incubated in CO2 incubator at 37 °C for 4 h, in this periods NAD(P)H oxidoreductases reduced a purple formazan intracellular and then 100 µl of crystalline solvent solution was added to each well. The intensity of the formazan was measured at 570 nm with a biotek Spectrophotometer (µ Quant, Biotek, Winooski, USA). TAC assay kit was used to determine antioxidant levels of samples by inhibiting formation of a free radical, 2,20-azino-bis (3-ethylbenzothiazoline-6-sulfonic acid) compound (Rel Assay Diagnostics, Gaziantep, Turkey) on HGF cell cultures for 24 h. The assay calibrated with Trolox equivalent as stable antioxidant. After cells incubated for 24 h, the medium was removed from the well plate and new medium placed. Standard solutions were added to wells, according to kit protocol, reagent 1 solution was added to each well and first spectrophotometric reading was carried out at 660 nm. Reagent 2 solution was added to each well and the well plate was incubated at room temperature for 10 min. Second spectrophotometric reading was obtained at 660 nm. In TAC assays kits, ascorbic acid used as organic antioxidant compounds for determined positive control. The TOS assay was carried out with a commercially available kit (Rel Assay Diagnostics, Gaziantep, Turkey) on HGF cell cultures for 24 h. According to assay protocol, complexes formed with the ferric ion are oxidized to ferrous ion by oxidants presented in the sample. In the acidic environment ferrous ions form chromogen colored. The pigment density measured spectrophotometrically is related to the total amount of oxidant molecules in the sample. Hydrogen peroxide (H2O2) was used for assay calibration. After 24 h cells incubation periods, medium removed from the plate and new medium placed. Standard solutions in kit were added to each well. According to assay protocol reagent 1 solution was added to each well. First spectrophotometric reading was carried out at 530 nm. After the first reading, reagent 2 solution was added to each well and then incubated for 10 min at room temperature. Second spectrophotometric reading was done at 530 nm. In TOS assays, H2O2, ROS was used as a positive control. Analysis of variance (ANOVA) was used to analyse the effects of the six flowable composite resins to MTT, TAC and TOS level. Significant main effects were analysed post-hoc using LSD multi comparison test. All statistical analyses were performed via SPSS 20 (SPSS Inc., Chicago, IL, USA) using a confidence interval of 95%. 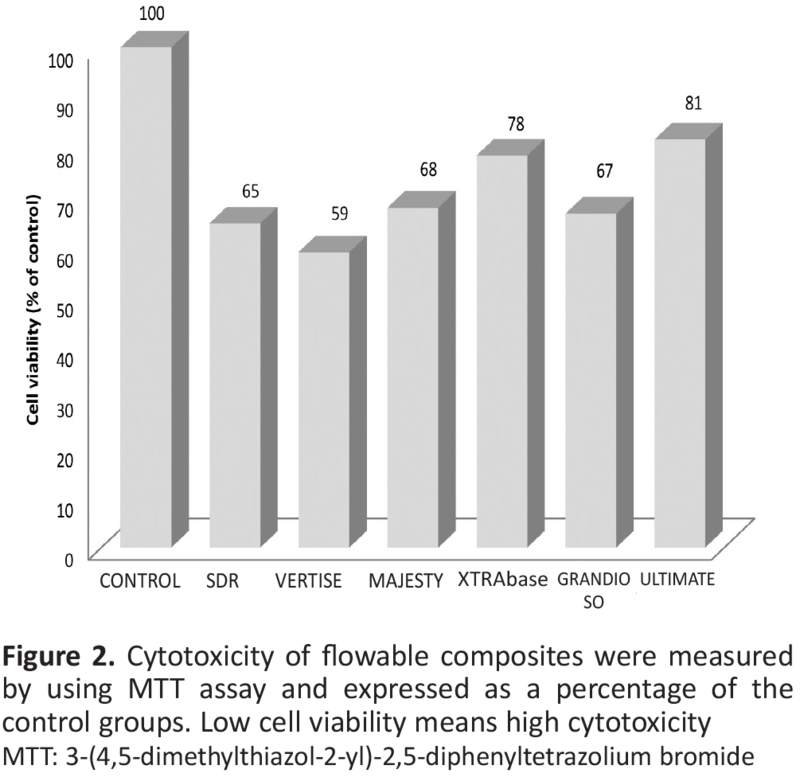 The cytotoxicity of flowable composites was measured by using MTT assay and expressed as a percentage of the control groups (Figure 2). Cell viability in all experimental groups was significantly decreased compared with the control group (p<0.05). Vertise flow exhibited significant cytotoxicity on cultured HGF and caused cytotoxicity at levels of 41%. Filtek ultimate and X-tra base showed lower cytotoxicity at levels of 18.5 and 21.7%. Vertise flow had statistically significant difference compared with X-tra base and Filtek ultimate (p=0.034, p=0.015). 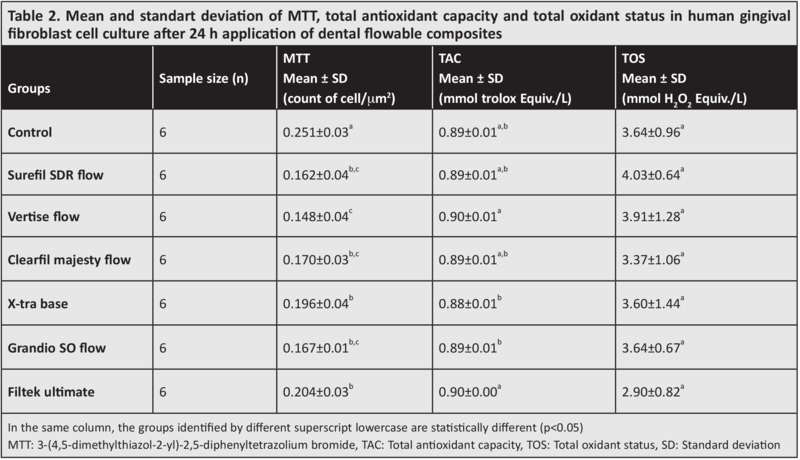 Table 2 presents the level of TAC and TOS in HGF cell culture after application of dental flowable composites. TAC level of Vertise was significantly different from X-tra base and GrandioSO (p=0.034, p=0.049). TAC level of Filtek Ultimate was significantly different from X-tra base and GrandioSO (p=0.025, p=0.036). TOS level increased in SureFil SDR and Vertise groups but it was not statistically significant difference. The lowest TOS level was seen in Filtek Ultimate. Table 3 demonstrates the differences (p value) between groups in terms of MTT, TAC and TOS. Cell culture assay has gained interest in recent years and are assumed to be appropriate methods to evaluate the biocompatibility of the restorative dental materials, since they are standardized, easy to apply, repeatable, cost-effective and take less time (18,19). In the present study biocompatibility of six different flowable composites on HGF were investigated with the MTT assay and TAC and TOS biological parameters assay in cell culture. Pulp and gingival fibroblasts are highly exposed to resin monomers after releasing from composite fillings to the oral cavity and this materials cause morphological changes and inflammatory reaction in cell (11). Therefore, primary cultures of human pulp and gingival fibroblasts were selected as optimal for biocompatibility testing of dental materials. Several approaches are possible to determine the cytotoxicity of material like LDH release, MTT formation, XTT formation, neutral red uptake, kenacid blue binding, acid phosphatase activity, sulforhodamine B binding and resazurin binding (20). But, MTT and NR tests are more sensitive and more reliable in the evaluation of a material’s toxic properties (21,22). According to the ISO 10993-5 specification, direct tests, indirect tests and extract tests are used for material and cellular contact methods in tests for in vitro cytotoxicity. In previous studies demonstrated a good association between direct and indirect contact tests, while the least sensitivity was seen in the extract tests (23,24). Based on previously performed studies direct material cellular contact method and MTT assay were used in this present study. The in vitro antioxidant/oxidant capacity of materials was determined by measuring TAC and TOS levels with commercially available kits. The major advantage of this test is to measure the antioxidant capacity of all antioxidants and all oxidant in a biological sample. Imbalance between antioxidant defence system and free radicals cause oxidative stress. In the current study, alterations in the oxidant and anti-oxidant level of HGF cells were determined after exposure to flowable composite materials. Experimental studies support that, resin monomer effect redox balance and enhance ROS production and there are evidences about materials toxicity related with ROS production (16,29). Vertise and Filtek Ultimate had significant effect on TAC. SDR was slightly but not significantly induced level of TAC. Although increased TAC level, TOS level increasing was not prevented in Vertise and SDR. The decrease in cell survival was also observed by application of these two flowable materials. Increased TOS level and cytotoxicity were closely associated for SDR and Vertise flowable composites. Because oxidative stress is a common final mechanism of cell death (30). Schweikl et al. (31) reported dental monomers exposed cells indicated oxidative stress as a result of increased ROS and this oxidative stress acts as a signal for pathways activation which control cell death and viability through the redox sensitive activation of antioxidant proteins. Gallorini et al. (32) observed in their study that the resin monomer HEMA differentially caused oxidative stress in RAW264.7 mouse macrophages. In a study performed by Chang et al. (33) showed that Bis-GMA induced the expression of hemeoxygenase-1 which is an oxidative responsive gene and stimulate ROS production, apoptosis and cell death in pulp cell culture. The result of this study provides a better understanding toward the protective effect of antioxidant capacity against formation of oxidative stress induced by flowable resin composite. The limitation of this study included testing only total levels of antioxidant and oxidant status. Evaluation of the different antioxidant enzyme such as superoxide dismutase, catalase, glutathione is recommended for further studies. Ethics Committee Approval: This study was granted ethical approval by the the Ethical Committee of the Atatürk University Faculty of Dentistry Atatürk (date/approval number: 22.04.2016/23). Concept: N.Ç., M.İ.Y., Design: A.T., M.İ.Y., Data Collection or Processing: A.T., Analysis or Interpretation: A.T., Literature Search: M.İ.Y., N.Ç., Writing: N.Ç., M.İ.Y. Brueckner C, Schneider H, Haak R. Shear Bond Strength and Tooth-Composite Interaction With Self-Adhering Flowable Composites. Oper Dent 2017; 42: 90-100. Sampaio CS, Chiu KJ, Farrokhmanesh E, Janal M, Puppin-Rontani RM, Giannini M, et al. Microcomputed Tomography Evaluation of Polymerization Shrinkage of Class I Flowable Resin Composite Restorations. Oper Dent 2017; 42: E16-E23. Kawai T, Maseki T, Nara Y. Bonding of flowable resin composite restorations to class 1 occlusal cavities with and without cyclic load stress. Dent Mater J 2016; 35: 408-17. Karadas M. The effect of different beverages on the color and translucency of flowable composites. Scanning 2016; 38: 701-9. Tarcin B, Gumru B, Peker S, Ovecoglu HS. Evaluation of Radiopacity of Bulk-fill Flowable Composites Using Digital Radiography. Oper Dent 2016; 41: 424-31. Sumino N, Tsubota K, Takamizawa T, Shiratsuchi K, Miyazaki M, Latta MA. Comparison of the wear and flexural characteristics of flowable resin composites for posterior lesions. Acta Odontol Scand 2013; 71: 820-7. Miletic V, Pongprueksa P, De Munck J, Brooks NR, Van Meerbeek B. Curing characteristics of flowable and sculptable bulk-fill composites. Clin Oral Investig 2017; 21: 1201-12. Ilie N, Hickel R. Investigations on a methacrylate-based flowable composite based on the SDR technology. Dent Mater 2011; 27: 348-55. Moslemi M, Fotouhi Ardakani F, Javadi F, Khalili Sadrabad Z, Shadkar Z, Shadkar MS. Evaluation of Er,Cr:YSGG Laser Effect on Microshear Bond Strength of a Self-Adhesive Flowable Composite in the Dentin of Permanent Molar: An In Vitro Study. Scientifica (Cairo) 2016; 2016: 4856285. Franz A, Spinell T, Graf A, Wutzel H, Liska R, Watts DC, et al. Cytotoxicity of post and core composites as a function of environmental conditions. Dent Mater 2014; 30: 1179-86. Tadin A, Marovic D, Galic N, Kovacic I, Zeljezic D. Composite-induced toxicity in human gingival and pulp fibroblast cells. Acta Odontol Scand 2014; 72: 304-11. Gupta SK, Saxena P, Pant VA, Pant AB. Release and toxicity of dental resin composite. Toxicol Int 2012; 19: 225-34. Lee DH, Lim BS, Lee YK, Ahn SJ, Yang HC. Involvement of oxidative stress in mutagenicity and apoptosis caused by dental resin monomers in cell cultures. Dent Mater 2006; 22: 1086-92. Krifka S, Spagnuolo G, Schmalz G, Schweikl H. A review of adaptive mechanisms in cell responses towards oxidative stress caused by dental resin monomers. Biomaterials 2013; 34: 4555-63. Schweikl H, Spagnuolo G, Schmalz G. Genetic and cellular toxicology of dental resin monomers. J Dent Res 2006; 85: 870-7. Demirci M, Hiller KA, Bosl C, Galler K, Schmalz G, Schweikl H. The induction of oxidative stress, cytotoxicity, and genotoxicity by dental adhesives. Dent Mater 2008; 24: 362-71. Katakwar P, Metgud R, Naik S, Mittal R. Oxidative stress marker in oral cancer: A review. J Cancer Res Ther 2016;12:438-46. Moharamzadeh K, Brook IM, Noort RV. Biocompatibility of resin-based dental materials. Materials 2009; 2: 514-48. Wataha JC. Principles of biocompatibility for dental practitioners. J Prosthet Dent 2001; 86: 203-9. Putnam KP, Bombick DW, Doolittle DJ. Evaluation of eight in vitro assays for assessing the cytotoxicity of cigarette smoke condensate. Toxicol In Vitro 2002; 16: 599-607. Lonnroth EC, Dahl JE. Cytotoxicity of liquids and powders of chemically different dental materials evaluated using dimethylthiazol diphenyltetrazolium and neutral red tests. Acta Odontol Scand 2003; 61: 52-6. Fotakis G, Timbrell JA. In vitro cytotoxicity assays: comparison of LDH, neutral red, MTT and protein assay in hepatoma cell lines following exposure to cadmium chloride. Toxicol Lett 2006; 160: 171-7. Cao T, Saw TY, Heng BC, Liu H, Yap AU, Ng ML. Comparison of different test models for the assessment of cytotoxicity of composite resins. J Appl Toxicol 2005; 25: 101-8. Saw TY, Cao T, Yap AU, Lee Ng MM. Tooth slice organ culture and established cell line culture models for cytotoxicity assessment of dental materials. Toxicol In Vitro 2005; 19: 145-54. Ulker HE, Erkan AI, Gunaydin N, Kahvecioglu F, Ulker M. Comparison of the mechanical and biological properties of self-adhering materials. J Adhes Sci Technol 2016; 30: 1119-30. Barbosa MO, de Carvalho RV, Demarco FF, Ogliari FA, Zanchi CH, Piva E, et al. Experimental self-etching HEMA-free adhesive systems: cytotoxicity and degree of conversion. J Mater Sci Mater Med 2015; 26: 5370. Urcan E, Scherthan H, Styllou M, Haertel U, Hickel R, Reichl FX. Induction of DNA double-strand breaks in primary gingival fibroblasts by exposure to dental resin composites. Biomaterials 2010; 31: 2010-4. Engelmann J, Janke V, Volk J, Leyhausen G, von Neuhoff N, Schlegelberger B, et al. Effects of BisGMA on glutathione metabolism and apoptosis in human gingival fibroblasts in vitro. Biomaterials 2004; 25: 4573-80. Krifka S, Seidenader C, Hiller KA, Schmalz G, Schweikl H. Oxidative stress and cytotoxicity generated by dental composites in human pulp cells. Clin Oral Investig 2012; 16: 215-24. Pauly K, Fritz K, Furey A, Lobner D. Insulin-like growth factor 1 and transforming growth factor-beta stimulate cystine/glutamate exchange activity in dental pulp cells. J Endod 2011; 37: 943-7. Schweikl H, Hiller KA, Eckhardt A, Bolay C, Spagnuolo G, Stempfl T, et al. Differential gene expression involved in oxidative stress response caused by triethylene glycol dimethacrylate. Biomaterials 2008; 29: 1377-87. Gallorini M, Petzel C, Bolay C, Hiller KA, Cataldi A, Buchalla W, et al. Activation of the Nrf2-regulated antioxidant cell response inhibits HEMA-induced oxidative stress and supports cell viability. Biomaterials 2015; 56: 114-28. Chang MC, Chen LI, Chan CP, Lee JJ, Wang TM, Yang TT, et al. The role of reactive oxygen species and hemeoxygenase-1 expression in the cytotoxicity, cell cycle alteration and apoptosis of dental pulp cells induced by BisGMA. Biomaterials 2010; 31: 8164-71.